What's Your Weakest Link in Customer Experience? 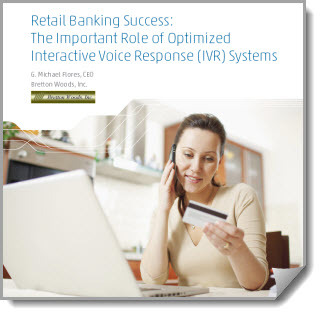 This whitepaper examines how, in light of the shifting landscape in banking, an optimized IVR program is more important than ever as an element of overall customer experience. Research and anecdotal evidence directly from bankers indicate that when used appropriately, IVR can reduce costs and promote customer satisfaction and loyalty at a time when both are desparately needed. With 18 pages of analysis, tables, interviews, and findings, this whitepaper provides insights you can use to improve customer care and protect your brand experience.